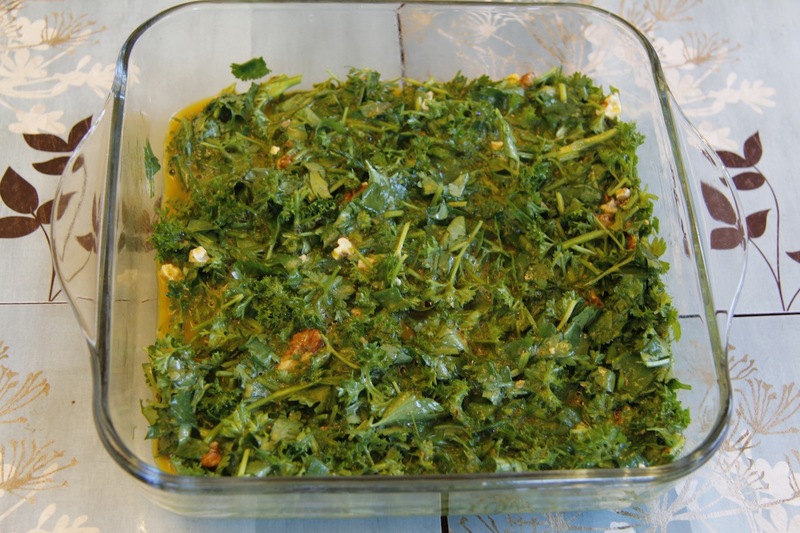 What do you do when you start to run out of swiss chard and there is nothing new in the garden? You eat parsley of course. I am not brilliant at growing herbs, but I can grow parsley – or rather it has, despite my efforts, seeded all over our garden. In the spring it grows voraciously and then at about this time of year it suddenly all goes to seed. I don’t want to waste the parsley and I have found a good way to keep it is to make parsley and walnut pesto and then to freeze it. Luckily I had some lovely walnuts that Helen had brought up at Easter so I used them. 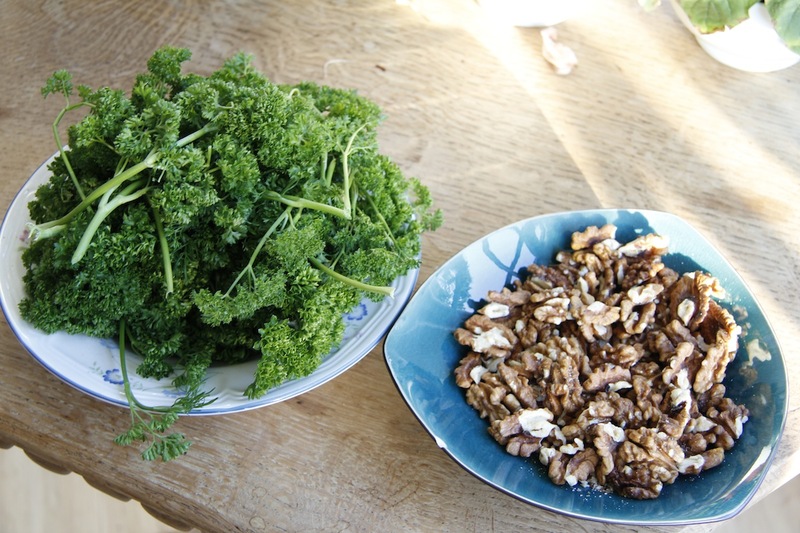 Parsley and walnut pesto: parsley, walnuts, garlic, parmesan, olive oil – put everything in the food processor and whizz until it is a paste – you will need to keep adding oil until you get the consistency you like. Put in pots, cover with a little oil and freeze or eat. 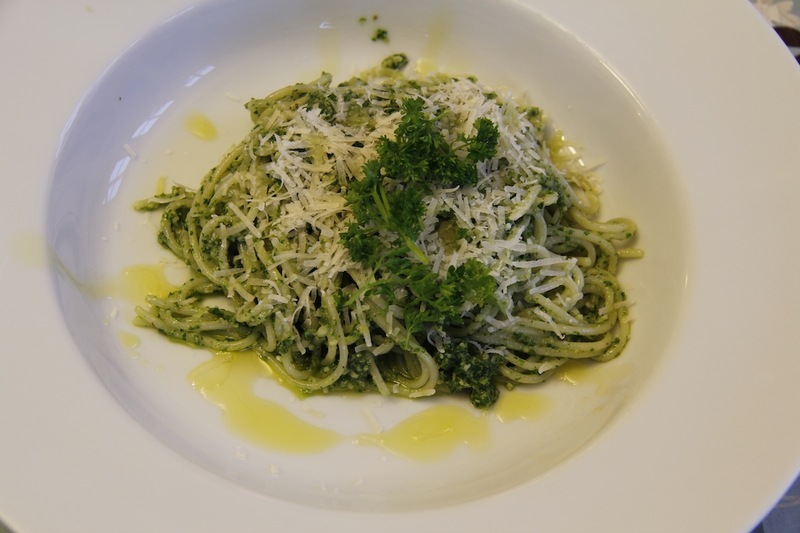 We had the parsley pesto on spaghetti for dinner served with harrisa roasted carrots and avocado salad. 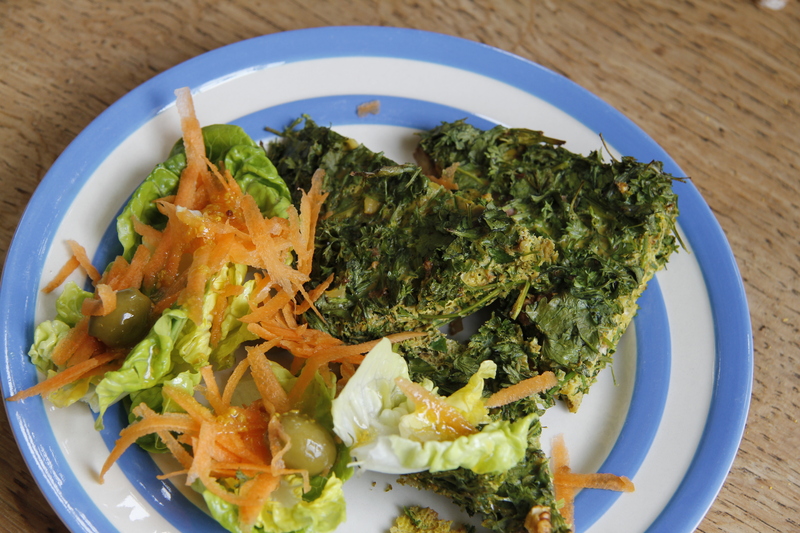 The salad is inspired by a Jamie Oliver salad, but a bit easier to make. For the salad (for two people) about 3 carrots, one avocado, few lettuce leaves, 1 lemon, harrisa, red wine vinegar, olive oil. Cut the carrots in half and then in half lengthwise – they should be chunky batons. Cook in boiling water for 5-10 minutes or so – until just cooked. Pop in an oven proof dish with a couple of tsp of harrisa, the lemon cut into two halves, oil and red wine vinegar. Mush it all around and then roast for 20 minutes. Remove from, squeeze juice from lemon into pan. 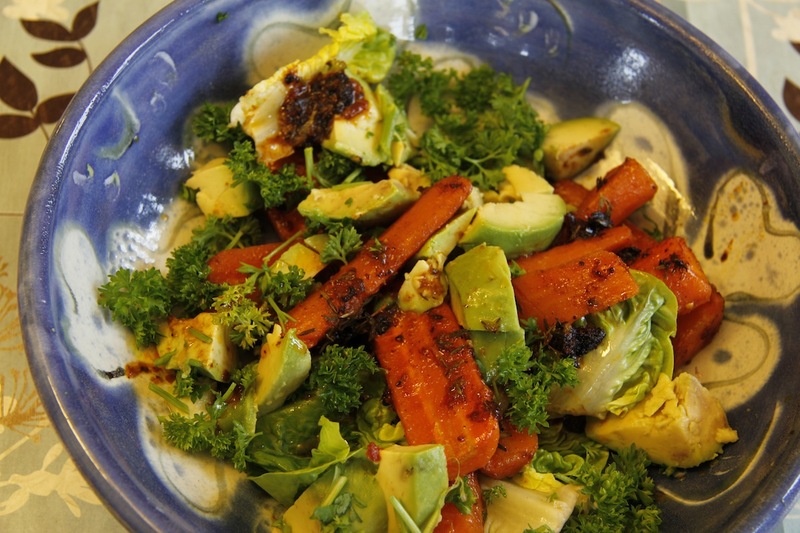 Put carrots with avocado (cut into slices) and lettuce in a bowl. Mix juice in pan with a little more olive oil and red wine vinegar to taste – drizzle over the top and serve. You can eat it warm, but it is lovely cold as well. I sprinkled ours with parsley – of course. The next day we consumed even more parsley in an Iranian herb kuku – essentially an Iranian egg and herb (or vegetable dish). My friend Mike made me this for dinner a few weeks ago and I have been craving it everyday since then. Ingredients: 6 duck eggs, handful of walnuts roughly crushed in my weak hands (so not crushed very much), 1 tbs flour, half a tsp of turmeric, two big handfuls of chopped parsley, handful of coriander and small handful of dill. You can add whatever herbs you like – you do need to add a huge amount of herbs though. In the bowl it should look as if it is mainly herbs with some egg binding it together. Break eggs and whisk with seasoning, turmeric and flour. Add in the herbs and walnuts and mix. Put in a greased oven-proof dish and then bake for 20 minutes at about 180C or until it looks cooked. Cut into slices and serve. It is amazingly delicious.